Susie was the second female addition to the family. 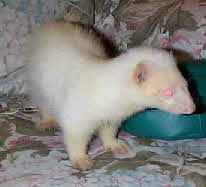 On finishing a day’s ferreting with Fred, the farmer told us that a ferret had been seen at an adjacent cattery. One of Fred’s ferrets had been lost when ferreting previously , so we made a trip to check if it was his. It was not, but he did offer to find a home for her. She was in a in a pet carrier and I saw a small frightened, very thin ferret. I picked her up and offered to adopt her. 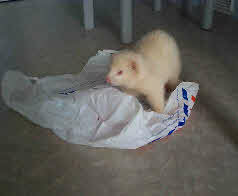 Fred’s lost ferret was later found. Susie was a young ferret, and she soon filled out, due to being well fed. She proved to be a gentle and affectionate ferret. Months on, she more than doubled in size, and would play given the opportunity, and was very keen to explore her surroundings. My idea of housing her in the same cage with Molly never happened, Molly had an attitude problem with other ferrets. I had her spayed to prevent her coming into season, with the accompanying health problems. Susie had a teat removed that had become infected, also she had a severe eye infection caused by a blocked tear duct that required antibiotics for long time before eventually clearing up. Grace later shared her cage, fussing over Susie. Susie enjoyed the company of other ferrets, cohabiting with Grace or playing with Lucy, Ruby and Kitty also, during cage cleaning time. The picture to the left is Susie when first got, in a short time she looked like the the right picture. 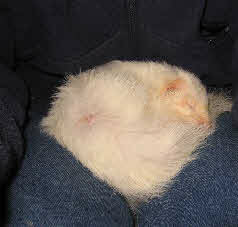 Bottom centre, an elderly Susie is pictured during February 2010 curled up on my lap. She is about eight years old. Update: on March 9th 2010 Susie died. For a week previously she had been kept indoors, sharing a cage with Zach who was recuperating at the same time from an operation. She was found curled up as if asleep and still warm. The previous evening (alive) she was snugly resting happily with Zach.